These are musings brought upon me by my friend Rick (who blogs over here) in an e-mail today as I plan some seminars on the Fathers. One of the hard sells these days can be the deep theology of the Church Fathers. What does homoousios have to do with me? I already know why Jehovah’s Witnesses are wrong; why discuss the patristic discussions of Christology? Isn’t it more important just to accept Jesus in your heart? This is all so impractical. But Rick just sent me an e-mail challenging all of that. Where do we evangelicals tend to get our vision of mission? The Great Commission. What do we see happening there? If you know the Christological debates of the fourth century, you will know that those words alone pose no problems for an Arian. This is an important point, if we want to encourage people to read Sts. Athanasius, Basil, Gregory of Nyssa and of Nazianzus (‘the Theologian’), Ambrose, and Augustine for their Christology. For us, in a post-Nicene, post-Reformation, post-Christendom world, it is ‘obvious’ to many a believer that when ‘all power is given unto [Christ] in heaven and in earth’ he is, therefore, fully God. But an Arian would tell us that the authority was given to Him by the Father. So we need to go farther up in the passage. What did the Eleven do when the meet Our Lord and Saviour Jesus Christ? ‘When they saw him, they worshipped him.’ True, ‘some doubted’. But the Evangelist here seems to me to be commending the worshipful action of the Eleven. When they worship Jesus, the word is proskunésan, from the verb proskuneo. It is a word for worship used throughout Christian literature to refer to that kind of reverence and honour given to God alone. When people in the Bible give proskunésis to someone other than God, it is condemned. This is an argument normally used on Jehovah’s Witnesses; no doubt it can work with the sly neo-Arians in your midst. If Jesus is God and — working from the logical context of the day — there is only one God, when Jesus comes to the discussion of baptism, how can it be that people baptise in the name of the Father and of the Son (let alone the Holy Spirit?). Now we enter into the mystery of the Trinity. Here’s the usefulness of the Fathers. When the fourth-century Fathers were confronted by the Arian complaint that Jesus cannot be entirely God because that makes us at least dyotheists if not polytheists, new ways of thinking about Jesus’ divinity and his relation to God the Father needed to be found. The earlier Fathers had all asserted Jesus to be divine (so did the Arians). They had said things such as the Son and the Spirit being the Father’s hands (so did the Arians). They had even used the word Trinitas (first attested in Tertullian). Some had said that the Father and Son were homoousios or consubstantialis (the Arians did not). These last terms were taken by the Fathers of the fourth century and they built on the preceding tradition, using this theological framework as well as the internal arguments above to combat the Arian argument for the Son’s createdness. And when we decide that Father and Son are co-equal and co-eternal, why neglect the Holy Spirit? Is he not also one of those in whose name the disciples are called to baptise? This brings us full circle to mission. Embedded in a passage used on a regular basis to assert the importance of mission and the call to preach to the nations is Trinitarian theology. It is explicated as being Three Persons who share a single Essence or Substance, and eternal communion of being. 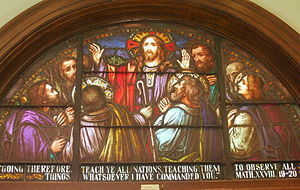 Jesus tells His disciples to go forth and make more disciples. They are able to do this because Jesus is God. And they are to baptise people in the threefold Divine Name(s). Because of His Divine authority, we can feel confident telling people Jesus’ teachings, even the hard ones, knowing that He is with always, to the very end of the age. And, having made disciples, they are to be baptised, to be washed clean of their old life through the symbol and sacrament of water, in the Name of these three Persons who are One God. They enter into the Divine Life, then. They enter as participants by grace (not nature, and not ontologically) into the everlasting communion of Father, Son, and Holy Spirit. And as we go forth, we are ourselves living as part of that communion, an everlasting love and joy that lies as the basis for all creation. As a member of this Divine Communion, how will you live your life today? As a person called to teach all nations by God Himself, how will you relate to the world around you? These are the questions the Trinity poses us as we look at mission. Don’t forget, I have a page (probably outdated by now) of Resources on the Holy Trinity. I’ve nominated you for the One Lovely Blog Award. See http://theraineyview.wordpress.com/2012/11/21/an-award-for-me-wow-thanks/ for details. A friend got the ball rolling on Facebook concerning the important question of missiology and theology, and that we should have theology that is intrinsically linked with mission. I was reminded of this piece of mine from a couple of years ago.